Emerson's quote was circling my mind last night when I woke at ten past midnight, aware that Richard was restless. I reached a hand from under the covers, threaded it through the railings of the hospital bed, and felt his forehead--it was a bit sweaty, and his right hand was twitching rhythmically. "Did you lose your rock?" I asked. I felt around for the flattened basalt beach-pebble our friend Blanche had sent from Washington. He had been holding it since he quit speaking during a restless period Thursday evening. 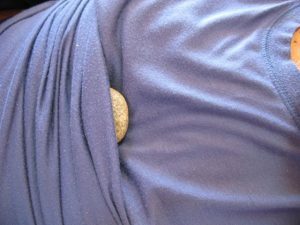 It wasn't under his hand, so I pulled back the covers and felt around, found the disc-shaped pebble, and replaced it under his hand. He squeezed my fingers and then let go. I felt on his chest for his other rock, a glacier-smoothed piece from our own valley, a gift from another friend who explained she treasured it because it embraced the contact where two different kinds of rocks met. It was still tucked into a fold of his night-tee, right over his heart. Despite his fast, shallow breathing, he seemed comfortable. Then he burped, his whole upper body convulsing as his stomach, empty since he quit eating on Tuesday, clenched. I felt his right bicep tense into a hard lump. His wheezy breathing slowed for a moment, as if he was listening. When I returned with the full syringe, he opened his mouth just far enough for me to remove the small sponge on a lollipop stick he was sucking on for moisture, squirt in the drugs, and replace the sponge. I crawled back under the covers, stuck my hand through the rails and found his hand. "Remember the Emerson quote?" I asked. "The one in the beautiful circular frame you made?" I recited the quote, ending with "...there is no end in nature but every end is a beginning." "You're headed for a beginning," I said, tears clogging my throat. "I'm going to miss you every day, but my love will be with you, and there's love coming from around the world. It'll buoy you through this ending that is also a beginning." His hand twitched, his fingers barely squeezing mine. "I love you so," I said. He burped convulsively again. The fast, shallow breaths resumed. This morning, when our friends arrived for Quaker meeting and silent meditation, his breathing was harsher and more labored. I felt his forehead--slightly sweaty, so I adjusted the blanket--and checked for his rocks. Both were in place. Then I looked at his skin: it was yellow, not his usual healthy ruddy tone, and seemed sunken and mottled. "You're closer to that combined ending and beginning, aren't you?" I said. The lid of one eye slid open partway. I gently closed it. "I love you." Half an hour later, when his weekend hospice nurse arrived, we were gathered around, Molly and I on the bed, our friends at Richard's feet, talking and laughing. Katie took out her stethoscope to check his pulse, placed it on his chest, and listened intently. "I've got 106," she said. I turned around to see if Molly had noted that data to his chart, and when I looked back to Richard, the hair on my neck prickled. His chest was still. We all watched his chest. Nothing. Then one sudden gulp of air. A minute later, another. And then silence. Katie took out her stethoscope again to listen. "He's gone." She headed off to make the official calls, we hugged each other, cried, and hugged Richard's now-still form. Molly went next door to get her boyfriend, Mark. Then we gathered around Richard's hospital bed again and sat with him, enfolding him in the peace of our weekly worship one last time. 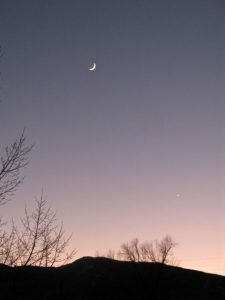 This evening, I watched the bright crescent of the new moon set in the afterglow of sunset, with Venus sparkling below it. "That's the moon we share," I said out loud, trusting that Richard's spirit could hear me. "Every end is a beginning." 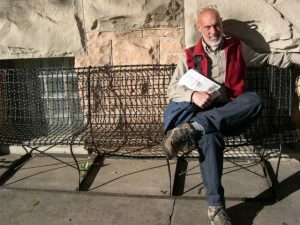 Richard Cabe, 1950-2011. Beloved husband, father, brother, friend, teacher. 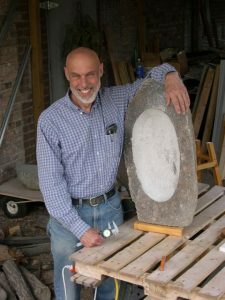 Sculptor who saw rocks as "ambassadors of the Earth," bringing their forms and voices into our everyday lives and rituals. Travel well, my love. You'll be in our hearts. Always.